We use a bench for not only sitting but also storage. Find your best design storage bench for outdoor dinning for family from our list here. Choosing to include an outdoor bench in your patio area could be one of the best home design decisions you ever make. While a typical outdoor dining set is adequate for housing guests and family members, it doesn’t solve your problem of storage. Where are you supposed to put all those bits and pieces you only use when you’re outdoors? An outdoor storage bench solves all those problems. You can use them to house accessories for the swimming pool, barbeque tools for when you’re cooking up a feast, and even all those cumbersome Christmas decorations as well. Rather than clutter up the interior of your home, they can fit neatly in a bench that has been designed for that very purpose. However, because it’s called an outdoor storage bench, it’s suitable for more than just storage. In a world that’s moving towards items that can be multifunctional, this bench also functions as a seat. Some have cushions you can remove and store inside, while others are wicker to tie in beautifully with wicker patio furniture sets. If you believe such a convenient piece of furniture could tie in beautifully with your current setup, then look at these various options below. 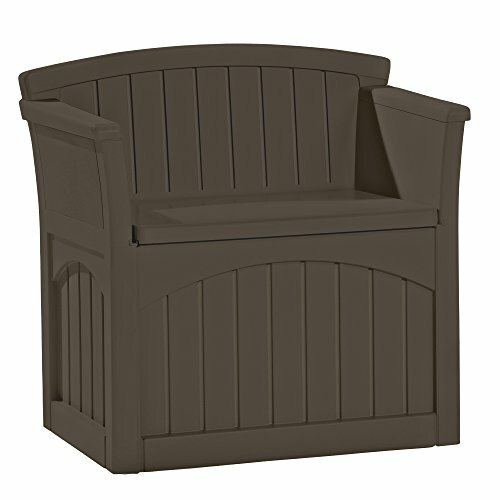 If you’re a big fan of wooden furniture in your patio area, then you’re going to love this outdoor bench from Keter. Not only is it a beautiful garden bench seat that can cater to 771 pounds of weight – or two adults – but it’s also a functional storage container as well. You can sit on it with its armrests and backrest or lift the top and take out items you have stored inside. The lid is even lockable to ensure they’re well protected when you’re not around. However, the seamless design of this bench means it’s not immediately obvious it functions as both a seat and a storage box. When it comes to lasting the distance, Keter outdoor bench ticks all the boxes. With a robust resin construction, resistance to moisture and plenty of ventilation, it maintains its integrity in the harshest of weather. Even continual use by animals, children, and adults, will not weather this bench. 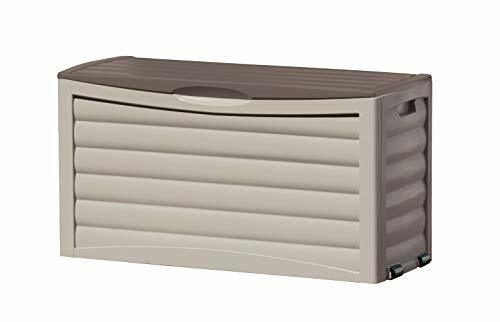 If you require 70 gallons-worth of space but don’t want to invest in cumbersome cabinets in your home, then it might be time to take a closer look at this outdoor storage bench from Keter. Outdoor furniture is made to put up with a lot, but what if you could invest in a storage bench that required no maintenance or upkeep? Rather than paint and repair a wooden outdoor furniture set, you can buy this robust plastic storage container that’s both a seat and a storage facility. While it looks like a lovely wood trunk, it’s a robust UV-resistant polypropylene resin box that handles everything you throw at it. No amount of wind or rain will prove too much for this outdoor bench. If you have a lot of stuff to store outside, then this is a good option for you. It has an 80-gallon space capacity, with the top being functional as a seat as well. Therefore, you can add it to your outdoor entertainment area and have it blend in seamlessly with your other furniture. Aside from its functionality, you will also enjoy how easy it is to own. It’s effortless to assemble, requires no painting or maintenance, and it has wheels and handles for you to move it around. What’s more, it can comfortably seat two people with a combined weight of up to 550 pounds. 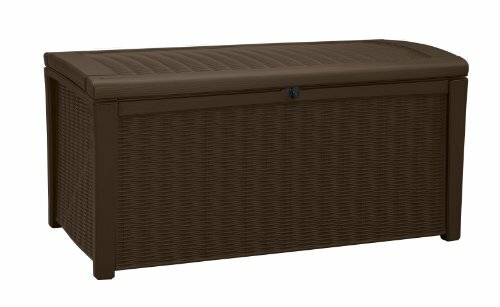 If you’re in the market for both a seat and a storage facility, this outdoor storage bench could be the answer to both those problems. 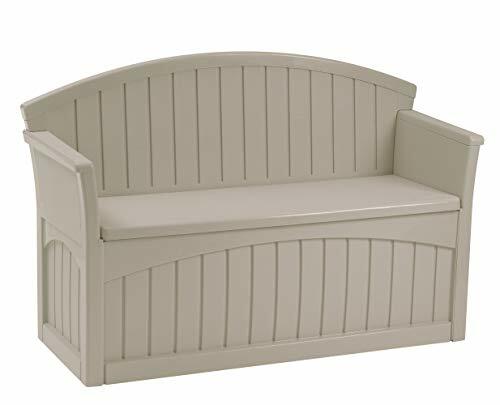 When you’re looking for an outdoor storage bench to function as both a seat and a storage facility, it can be tricky to find the right one. While wood looks lovely, it can soon fall victim to the elements – meaning you’ve wasted a significant amount of money. However, with this Keter deck box, you’re able to achieve both that wood look and structural integrity as well. 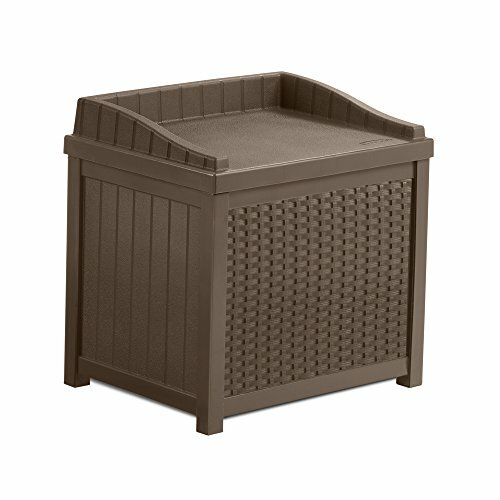 Designed to mimic the wood grain of a traditional wood outdoor storage box, it’ll tie in with your patio furniture beautifully. However, rather than require painting and maintenance on a regular basis, it will handle the elements without you having to get out your toolbox. This outdoor bench is made of robust, durable, and weather-resistant plastic resin, but is refined with its wood paneling appearance. Therefore, if you do happen to have an outdoor furniture set made of wood, it’s going to blend in beautifully. It’s available in three colors to suit your needs and is a comfortable seat for two as well. Fill the box with items, close the lid, then use it as a seat. It’s that easy. It also has an automatic opening function for user convenience, as well as being easy to move around your outdoor entertainment area. If you require a functional and robust storage facility, this one could grab your attention. One of the main reasons people don’t opt for a wood outdoor storage bench is because of poor weathering, but what if you didn’t have to worry about that? Pemberly Row, seeing the troubles that homeowners face, now manufacture a storage bench that’s both wood and handles all the outdoor elements can throw at it. Therefore, if wood furniture was always your first choice, you no longer need to compromise. 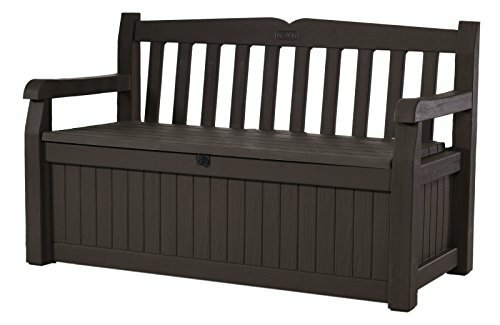 This outdoor bench is made from high-quality Balau hardwood in a dual stain finish, it’s weather-resistant, and it also has UV protection as well. Therefore, even when it’s been windy, raining, or you’ve been enjoying the intense sun, this storage bench will remain looking as good as new. It will tie in beautifully with all your other wood furniture in your patio area, and functions as both a storage box and a seat. Whereas before you would have needed to store your outdoor goods indoors, you now get the convenience of having everything in one place outside. To use this storage bench for storage is simple. Open the lid, add your items, close it, then sit on it. It’s a beautiful multipurpose item any homeowner would be proud to own. Wicker furniture has long been a favorite option for many homeowners, but did you know you could get a wicker storage bench for storage as well? Some homeowners prefer to store their outdoor goods inside purely because they can’t find a box to match their wicker furniture. Now, however, that option is available. 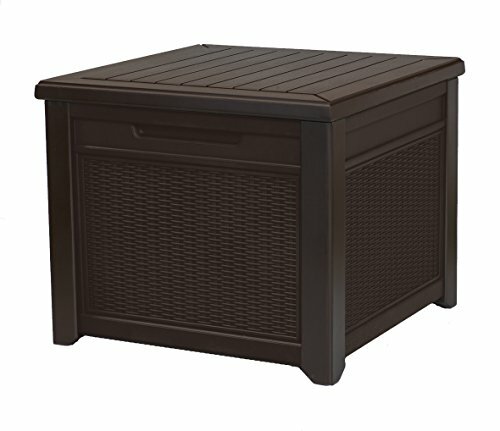 This wicker outdoor bench can hold 50 gallons worth of goods but doesn’t look like a plain storage box in the slightest. Instead, it’s elegantly designed to look more like a seat that’s capable of holding up to 360 pounds of weight. If you’re worried about the weather ruining it, don’t be. It features PVC coating, has a water-resistant lining, and is primarily designed to withstand poor weather conditions. Therefore, even in the pouring rain, you can rest assured none of your valuable possessions within it are getting wet. If you don’t want to compromise on looks in your patio area, now you don’t have to. Purchase this wicker container bench and liven up your entertainment area. While Keter Sumatra bench is not waterproof, it will fulfill your outdoor storage requirements nicely. It’s a gorgeous rattan style to tie in with other rattan style furniture, is available in white or brown, and will keep the contents dry as well. However, the benefits don’t end there. 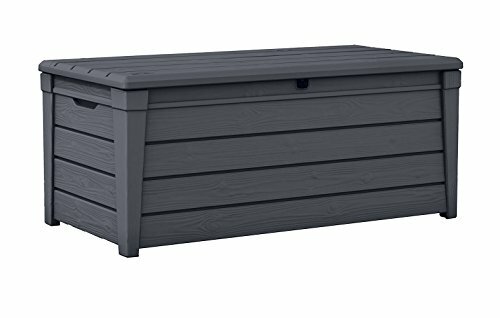 When you purchase this outdoor storage box, you benefit from both a place to store your outdoor goods, as well as an additional seat. It can seat two people or up to 770 pounds, and it’s comfortable as well. It’s also lockable so you can keep the contents safe while you use it as a seat. The opening is automatic thanks to its robust hinged lid, and it provides more space inside than most other storage boxes. In fact, it has 135 gallons worth of room for all your equipment such as pool gear, barbeque equipment, and more. 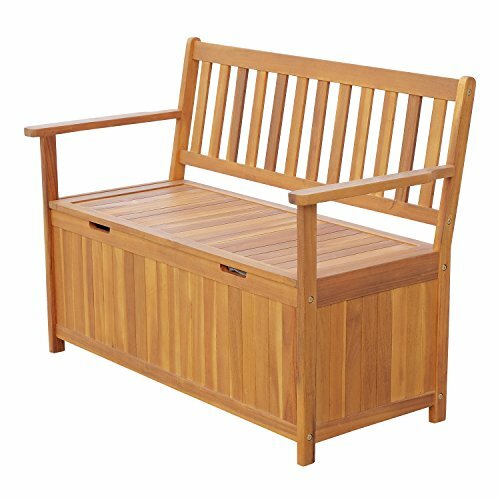 When you need a storage bench or additional seating that will last the distance while looking attractive in any outdoor space, you will find this one ticks all the boxes. There’s every reason to consider purchasing it today. If you live close to the sea, then you’re bound to want your outdoor storage bench to tie in with this overall theme. After all, if your home décor is an eclectic mix of blues, whites, and nautical themes, then there’s every reason to make sure all your outdoor furniture is as well. While it might be a rarity on the market, you are sure to find this outdoor storage bench ticks all the boxes for both style and functionality. It’s made of sustainable eucalyptus wood, weighs a robust 50 pounds, and is functional as both a seat and a storage box. You can add your items to it, close the lid, tie on the luxurious nautical-themed cushion then sit back and relax. While some assembly of this outdoor storage bench is required, you will be blown away by the results. It looks stunning poolside, or even on a deck or in a sunroom. Anywhere you put this bench, you will love how striking it appears. When the time comes to add extra seating and storage to your outdoor entertainment space, consider this bench from Home Improvements. While a plastic outdoor storage bench is perfect for those with no set outdoor style in mind, sometimes a wood one works so much better. However, many homeowners are concerned about how well they hold up in the weather, so tend to opt for benches they don’t always like. This one from Home Improvements may be the answer to your problems. This Acacia wood bench is both hardy and stylish. And it ticks all the boxes for weather resistance as well. It has a slat design to allow for ample ventilation but is also watertight to stop anything within the storage compartment that bad weather can damage. While you do need to assemble this outdoor bench yourself, you will be more than impressed with the outcome. It’s striking in its appearance to tie into your outdoor patio set beautifully while being multipurpose as well. Use it as an additional seat while it houses all your goods. If your hunt for a new outdoor bench for storage has been unsuccessful due to your desire for something a little bit different, this Landmann Cubi storage bench might be the answer. While it functions how you would expect a outdoor bench to, it does so while being designed to stand out from the crowd. It’s made of robust Acacia hardwood, has a timeless slat panel design, and is suitable for the safe and secure storage of cushions and other outdoor goods. While you can use it for the discrete storage of possessions, it also functions as a comfortable seat as well. Put the lid down and enjoy the comfort on offer. Aside from its functionality, the company also designed this bench very well. It has a steel hinge on the top to make it effortless to open, it has powder coating to make it weather resistant, and you can even remove the bottom slat panel for cleaning. What’s more, it’s effortless to assemble in any area of your home. If you’re ready for your entertainment area to look striking, then this outdoor bench from Landmann can help to achieve that goal.